Welcome To My Vintage Bounty Blog! about it My website is www.vintagebounty.com and I just know that you will enjoy visiting it. You will find a bounty of vintage goodies there that I have collected from family, estate sales, treasure hunts, and more. I am looking forward to sharing with you, my passion for days gone by, and how the vintage era inspires me. I find it amazing as well as comforting, the emotions that certain vintage images can evoke. In the times that we are living in, I find myself feeling discouraged, and often saddened by so many changes that are happening all around me. I start to feel a real longing to go back in time, to remember all of the enjoyment of a totally different era that brought me a lot of happiness. But we all know that we can't go back in time, don't we? Well......maybe not in the sense of returning to the decade of our choosing, but what about re-awakening those memories that we loved? What about re-discovering the joy, and finding ways to keep it with us? 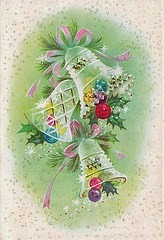 For me, all it takes is gazing at a vintage Christmas card from the 50's or 60's, and I'm on my way!! That alone can take me back to my childhood living room at Christmas time, with all of the decorations and the stereo playing "The Little Drummer Boy" record. Yes, I said record!! But more on Christmas memories later. For now, I just want to invite you to visit my web site, and join me here on my blog every week, for a trip down memory lane! I have so much to share with you!! And remember: You really can go back! I Just Love These Old Vintage Cards!